Java is one of the most universal programming languages, applied across a number of environments, devices, and domains. Its uses range from mobile applications for Android to complex backend architecture, embedded software for IoT, to data-heavy enterprise systems. This explains why Java developers are currently in high demand among businesses and startups all over the world. Having helped dozens of businesses worldwide hire Java developers in Ukraine, we at Daxx have our finger on the pulse when it comes to IT staffing trends and strategies. We’ve decided to share some of our insight on the recruitment process, especially with regard to hiring offshore Java developers. If you are planning to tap into the Ukrainian Java IT talent pool to augment your in-house development team, this article is for you. Since its emergence around 25 years ago, Java has gained a strong following among the developer community, with the open source language reportedly boasting as many as 9 million professionals back in 2009. If we consider that Java adoption grew threefold in just 6 years - from 3 million in 2003 to 9 million in 2009 - we can assume that the actual number of Java programmers worldwide is significantly bigger today. But even these 9 million would be an enormous chunk of the 20 million developers worldwide. The language has ranked as the third most popular technology for developers, according to StackOverflow Developer Survey, for 5 consecutive years. What’s more, Java is a long-time leader among the most popular programming languages, according to TIOBE Index. The PYPL Index, another reputable source on the popularity of programming languages, has similar findings. Despite its widespread use, Java is a complex language with high barriers to entry, meaning that most Java developers are professionals with a good tech education. There are many Java programmers with a .Net background because the two technologies have many things in common. You will rarely meet a good Java software developer who is self-taught or simply finished an online course to learn the language. Due to the growing demand for their services, Java software developers are considered to be some of the most well-paid specialists in IT industry. For example, the average Java developer salary across the US is $102,064, according to the job search platform Indeed.com. However, salaries for Java experts vary greatly within the US, depending heavily on city and state. For example, San Francisco and New York top the list of high-earners with average Java developer salaries of $134k and $122k respectively. While the average salaries for Java experts around the world are slightly lower than those in the US, the language still pays well wherever you go. With a pool of over 53,000 software developers, Ukraine is considered to be one of the leading global outsourcing destinations. Due to high demand and competitive salary ranges, Java engineers make up a large proportion of the Ukrainian IT talent pool. 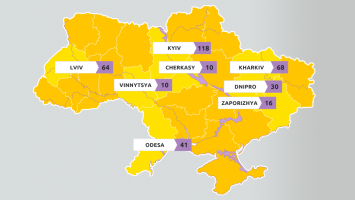 According to our research, there are at least 4,499 Java developers in Ukraine. This makes Java the second most popular language among Ukrainian developers, closely following C/C++. What makes Ukrainian Java developers so special? The growing amount of Java developers and Java software outsourcing companies in Ukraine can be attributed to the large number of technical universities located across some of the country’s major cities. These educational institutions give a solid technical and mathematical background, which is recognized worldwide. In addition to the above-listed schools, there are plenty of other good educational institutions across the country’s major IT hubs, including Lviv, Odessa, and Dnipro. The local Java IT talent pool is growing steadily, as developers rush to join one of the most dynamic and high-paying industries in the country. Yet, thanks to relatively high barriers to entry, most Ukrainian Java developers are middle- or senior-level specialists. However, this statistic comes with a caveat about Ukrainian Java developers. In Ukraine, middle-level developers usually have 3-5 years of experience in the field, while senior developers get the title after 5 years. This might seem strange to outsiders, as most other countries, including the USA, require at least 5 years experience to qualify as a middle specialist, and 10+ years to get to senior level. However, what you should take into account is not the number of years in the field, but the actual practical experience and skills your developer has. If a specialist has been involved in a very complex project, progress may be a lot quicker, meaning that they can achieve a senior level in just under 5 years. The Ukrainian IT industry is still emergent, which is why many experienced Java developers have a background working in other domains. If a developer has switched to software engineering from a different sphere, the chances are that their background was in finance, banking, or enterprise. As most financial institutions run on Java, a great number of today’s Java programmers started their career as IT specialists (support/DevOps engineers, database administrators) at a bank. However, the Ukrainian banking industry cannot offer the competitive salaries found in the IT sphere, which makes the career switch a reasonable option for most Java developers. Another common area of usage for Java is in enterprise-level products. Therefore, many Java developers have experience working with big data management and ERP systems before they begin accumulating direct experience. Although the Ukrainian IT industry is growing at a rapid pace, the amount of product companies and startups in the region is still rather low, especially compared to a large number of outsourcing companies. This means that most Ukrainian Java software engineers are currently involved in Java software outsourcing companies, where they often deal with projects in the fintech and cybersecurity spheres. With the demand for skilled Java programmers at an all time high, hiring the best candidates can be a challenging task. Even with a help of your own professional recruitment team, you need to put serious effort into the evaluation and interview process. To navigate the possible pitfalls of IT recruitment and make a successful hire, consider the following tips. Choose the model that works best for you. Ask yourself, do you have enough technical skills and experience managing software development processes on your own, or do need professional assistance in every aspect of the process? In the first case, you can hire software developers directly and manage them by yourself. However, the second situation is ideally suited for projects with Java software outsourcing companies. For short-term projects, e.g. adding a feature or two to an existing project or making simple updates, hiring a freelancer might be a reasonable option. However, if you prefer hiring developers to work on-site but don’t want to limit your candidate pool to the local IT talent only, consider IT relocation. To make sure you make the right choice, consider the pros and cons of each cooperation model or consult with an expert. Most job descriptions sound rather generic, providing little valuable information on the project and generalizing candidate requirements. This makes it difficult for candidates to understand the project requirements and see if they can meet your expectations at all. Make sure to specify technical requirements, as well as the soft skills/qualities you are looking for. It’s better to prioritize your requirements. For example, good knowledge of the key technologies in your stack is a “must-have”, while qualities such as experience in your domain, or a degree in a field relevant to your project are usually “nice to have”. Take into account the project specifics as well as your personal preferences (but only well-grounded ones). Help your candidate make an informed decision. Before you select and interview candidates, you should provide them with as much information on your project as possible (taking into account confidentiality, of course). The more you can explain about your project specifics, the higher your chances are of getting the developer interested in your job opportunity. Before you ask candidates to prove themselves worthy of your company, make sure to understand what you can offer them in return. Is it a unique tech stack they will be able to get experience in, or an innovative product they have a chance to contribute to? Do you offer a particularly competitive salary or some other benefits? CVs are a great way to pre-evaluate your candidates. It gives you an understanding of the technologies the candidate is skilled in, while providing a general overview of their experience. However, not all information can be included into a CV. For example, some of the candidate’s projects can be protected by NDAs, while pet projects, personal experiments, or something that is not directly related to the developer’s job might not be included at all. Moreover, you shouldn’t reject the candidate only because you think 2 years of experience isn’t enough for your project. Some developers can gain vast hands-on experience in various technologies and domains in just a year, while others can spend 5 years working on a single project with a limited tech stack. While giving a test task prior to the interview might not always be a good idea (remember, a developer’s time comes at a price), you should encourage your candidates to support their CVs with any information or assets they consider suitable. For example, a link to the candidate’s GitHub profile, relevant code samples, list of diplomas or awards, published articles, etc., can be a valuable addition even to a less than perfect CV. Establish and follow a solid interview process. Having a consistent and standardized interview process can help you better evaluate the candidates. This is why you always need to prepare for your interviews in advance. To start with, write down a list of the most important questions and topics you want to cover. In addition, you can draft possible answers to those questions to prepare for follow-ups. The information usually provided in a CV isn’t normally sufficient for making a good hire. You should always ask the candidate to tell you more about the projects they have been working on recently. Moreover, this allows you to verify if the information in the resume is true. Make each interview a dialogue rather than an interrogation. Instead of simply asking questions, prepare to answer some too. If a candidate doesn’t have any questions about the project or your company, the chances are that they simply aren’t that interested in working for you. If you don’t agree with some of the points your candidates make, ask them to explain their views and voice your own opinions on the matter. Remember, the truth can spark when opposing ideas collide. One more tip from us: If you like the candidate, don’t think too long before making an offer. Most skilled Ukrainian developers often interview for 3-4 jobs at a time - make the call before your competitors do. It takes on average up to 6 months to identify a mistake made when hiring a candidate, which makes the cost of a bad hire really high. This price can be even higher for a Java developer. Can you afford to have the wrong specialist work with the Java-based system your whole business runs on? Fast recruitment process. With Daxx, you get a dedicated Java development team ready to work in just one month. Large pool of pre-qualified candidates. We have access to hundreds of experienced developers with various levels of tech skills. Work with your developers directly. No need for third-party Project Managers. This typically results in higher levels of productivity and engagement. We take care of all the operational aspects of your cooperation with your developers. This includes fully equipped workplaces, taxes, sick leave, developer retention, and team building events. Constant support from a personal HR/Client manager. This results in the quick resolution of any communication issues. 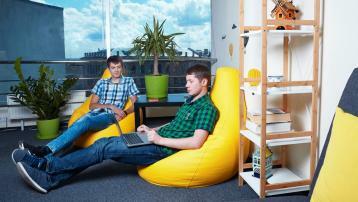 What’s It Like to Work with Ukrainian Developers?